Emily K here! If you can believe it, I have been at ESK for 3 years. It feels like just yesterday I was trying to figure out what a base was! I’d love to share my journey to ESK and ask for your help as we transition to the new shop in Dallas, GA.
My mom taught me to knit when I was a young teen. I saw her clicking away on cables and remember feeling fascinated that one strand of yarn could be turned into a beautiful scarf. After making a few horrendous scarves, my big red bag of awful furry yarn sat in the closet for many years. Fast forward 10 years (college and a couple of not-quite-right jobs) to me jumping out of my bed at 6 AM, running up 3 flights of stairs, and squinting at the computer to apply for the Social Media & Marketing Manager position at some store called Eat.Sleep.Knit. I immediately knew ESK was something special as no other job posting had evoked such a response…ever! I was ecstatic to get a callback from Erin, did a serious fist pump when I met and realized Erin & Dan are the most genuine, intelligent people in the world, and shed tears of joy in my living room when Erin asked, “Do you want to work here?” I feel so proud to be a part of all this…the yarn, the excitement, the fun, the rainbows, the cats, the joy, and, most importantly, the community! The customers, dyers, and friends are really what light this place up! Now that I have been here 3 years, I’ve fallen even more in love with this place. My co-workers are fantastic, my creativity is finally encouraged, and I laugh on the daily! So, my brain went nuts trying to think of a way to show my love and appreciate for all things ESK. I thought and I thought…I’m a pretty crafty person so a few decorative projects came to mind. The letters E, S, and K wrapped in yarn, eh. A painting, no. A giant ball of yarn, maybe. Then, I saw this adorable yarn mobile one morning on my daily scavenge of the online knitting world and thought, how can I make this special enough to hang in ESK? Hmm…the light! 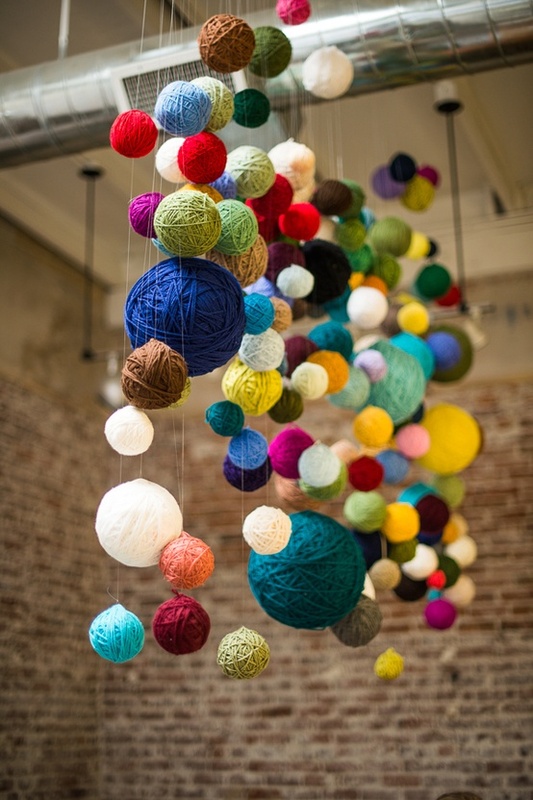 You all are what light us up so how could I incorporate yarn and our community into something that we could cherish in the new shop? Please include your name (legal name, Ravelry handle, whatever you’d like) and city/state on a paper/card with your yarn. 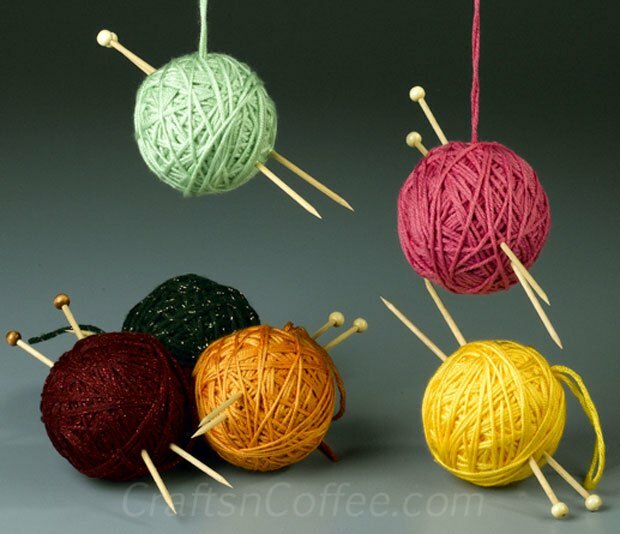 I will write them on two knitting needles that will stick out of your yarn ball! If you live locally, feel free to drop it off! The end result will look something like a mix between the two pictures below but your names will be added to the needles. You all are so important to us and I’m so excited to see the finished product when all of your pretty yarns combine! If you would like to be a part of this project, you get 3 things: my extreme excitement and appreciation for helping, a permanent home at the new ESK shop (not that you didn’t have one already), and the opportunity to be featured in one of our blog posts! Simply write BLOG on the paper/card you send with your yarn and give us a little back story on your yarn…what it was used for, why you love it, etc. You will then be entered into the random drawing to be interviewed by yours truly! I’ll ask you all kinds of fun questions and you can share your knitting journey too! Thank you in advance and stay tuned for a ‘Tour of the NEW Store’ blog post! Herald by Janina Hallio lends perfectly to Winning with the flowy eyelet repeats. Asymmetrical in design, Herald is knit diagonally with increases on one side and decreases on the other. This type of construction allows you to adjust the size with ease. Simply stop knitting once you achieve the size you desire. Chose a solid or variegated color of winning – any dye-style will show off in this pattern! We love how versatile and simple Herald is and can be worn with a cool tank top, airy tunic, or neat button-down. Use it to add a splash of color to all your outfits! Winning is THE summer top yarn. There are dozens of patterns that would knit up beautifully and keep you nice and cool as the summer months approach. We saw CherryCokeKissez’s version of Otherside by Melanie Berg and had to share! Knit at a lose gauge, Otherside is a flattering boxy top worked flat, starting at the front hem. We adore the addition of a lacy yoke knit in a contrasting colorway – it truly sets off this pattern! Leafy Baby Blanket by Leyla Alieva would make a lovely gift for a little one expected in summer. The leaf motif is precious and the pattern comes with written and charted instructions. Though this pattern is written for a sport weight, it would translate perfectly into a lightweight blanket using Winning. Just go down a needle size, swatch, and see what size needles creates the fabric you are looking for. Winning will also provide for a small amount of sheen and is machine washable which is an absolute for babies! Have you worked with Winning? Maybe started your Summer Yarns KAL? Share with us in the comments below.